If you cannot browse the Internet because you are bombarded with pop-ups that carry the label “Ads by SaveOn”, it is high time you implemented a reliable spyware removal tool. “Ads by SaveOn” is the label of coupons, advertisements, and other pop-ups generated by SaveOn, which is a free browser add-on for online shoppers. The browser add-on works on Internet Explorer, Google Chrome, and Mozilla Firefox. SaveOn is promote at saveonapp.info and can also be bundled with other free programs. If you like trying out various free applications, bear in mind that software distributors may bundle several programs together. We recommend that you pay close attention to the installation process so that get a chance to prevent unwanted or unreliable programs. “Ads by SaveOn” pop-ups can be displayed on various websites, including commercial and non-commercial websites. SaveOn does not to sell products of services but displays third parties’ advertisements. The fact that web banners, coupons, and advertisements contain the label “Ads by SaveOn” does not mean that SaveOn owns those products. SaveOn does no monitor third parties’ activities and does not accept responsibility for your interaction with third parties. If you do not want to receive various offers and advertisements, some of which may turn out to be deceptive, you should remove SaveOn as soon as you can. The program providing you with “Ads by SaveOn” pop-ups may monitor your online behavior. It may record your clicks, browsing history, and other information regarding your browsing behavior. When you contact the SaveOn, the company records your personal information, including your name, email address, and details that you provide in the message. If you have already tried SaveOn and do not want to encounter “Ads by SaveOn” deals any more, act right now to remove the adware program from your PC. Below you will find our instructions on how to remove the adware program, but we recommend using SpyHunter because this application can easily eliminate the unwanted application and shield the system from other adware program, browser hijackers, adware programs, Trojan horses, rogue anti-virus programs, and many other threats. 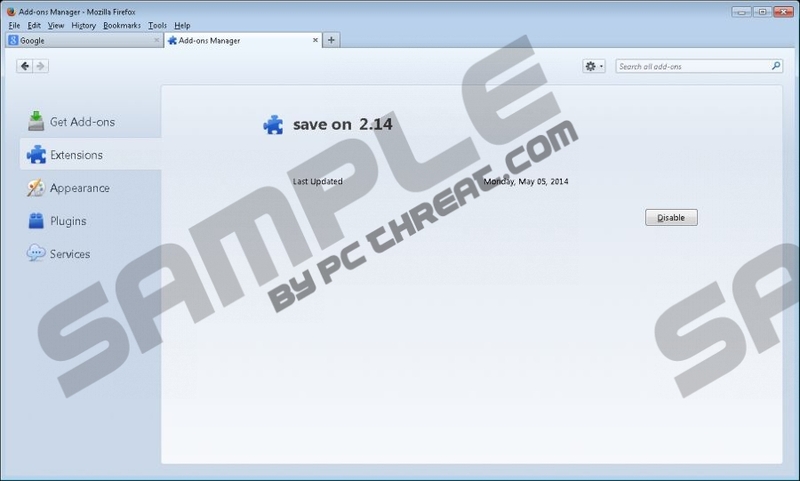 After uninstalling the adware program, you should install a reputable scanner which is capable of detecting SaveOn. We recommend that you implement SpyHunter’s scanner, which can identify the components of the adware program. If any are detected, remove the manually or invest in the program to have them removed and the system protected. Quick & tested solution for Ads by SaveOn removal.